- Not supported in browsers? - Not supported in Node.js? Modules ES Spec describes how to parse, instantiate and evaluate modules, but not how to get the files. 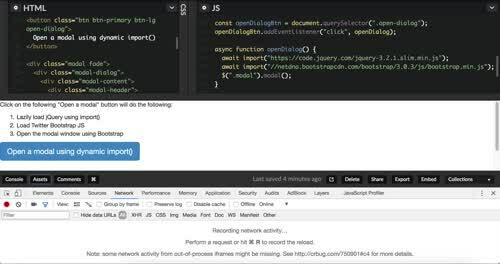 Construction — find, download, and parse all of the files into module records. Instantiation —find boxes in memory to place all of the exported values in (but don’t fill them in with values yet). Then make both exports and imports point to those boxes in memory. This is called linking. Evaluation —run the code to fill in the boxes with the variables’ actual values. Works because of the "instantiation" phase, which handles circular dependencies between the modules. Other examples: Code Splitting, polyfills, additional pages, 3rd party scripts, and services etc.